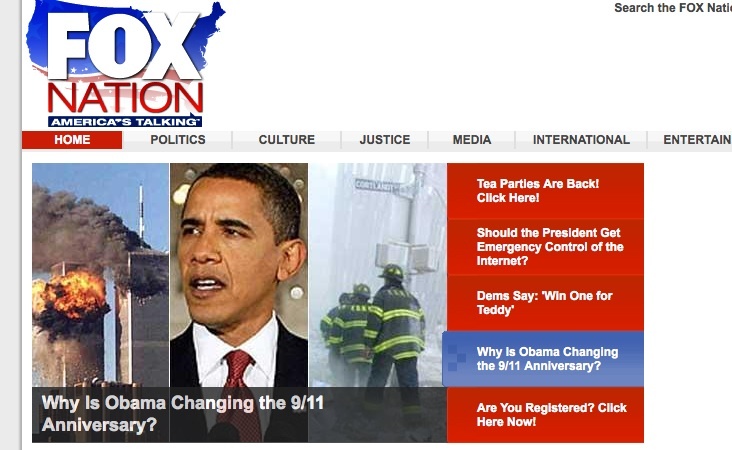 Fox Nation boasts that it's a community "committed to the core principles of tolerance, open debate civil discourse --and fair and balanced coverage of the news," yet we have repeatedly documented their deliberate efforts otherwise. Today's front page is another good example. One of the top stories "asks" "Why is Obama changing the 9/11 anniversary?" Clicking through to the story brings a paragraph of diatribe of inflammatory invective with no balance, not even a word about what Obama is trying to do or why. Add a sentence accusing Obama of being a racist and it could have been written by Glenn Beck. The Obama White House is behind a cynical, coldly calculated political effort to erase the meaning of the Sept. 11, 2001 terrorist attacks from the American psyche and convert Sept. 11 into a day of leftist celebration and statist idolatry. This effort to reshape the American psyche has nothing to do with healing the nation and everything to do with easing the nation along in the ongoing radical transformation of America that President Obama promised during last year's election campaign. The president signed into law a measure in April that designated Sept. 11 as a National Day of Service, but it's not likely many lawmakers thought this meant that day was going to be turned into a celebration of ethanol, carbon emission controls, and radical community organizing. If you click through to read "the full article" you come to a "special report" from the Weekly Standard which overlooks the fact that the national day of service originated in 2004 as a bipartisan effort of Democrat Charles Schumer and Republican Peter King, both New York lawmakers. Instead, the article makes the astoundingly partisan statement: "The plan is to turn a "day of fear" that helps Republicans into a day of activism called the National Day of Service that helps the left. In other words, nihilistic liberals are planning to drain 9/11 of all meaning." So who's really politicizing 9/11? In any event, Fox Nation could have easily presented this issue in a way that highlighted the views of Republicans, conservatives and anti-Obama folks without the rank hostility or acrimony the "fair and balanced" website chose instead. It's hard to believe it wasn't intentional.